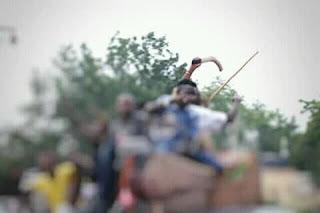 This is indeed worrisome even as some of them are being seen going to the Maiduguri Monday market to buy swords and cutlasses in an open day. We asked, what are they going to use these weapons for? How are they being metamorphos from chasing Boko Haram to political foot soldiers? What kind of politics is Borno planning for 2019. Our fears are too many, and we do not want bloodshed in the land. Yes. Our concern is on the 2019 gubernatorial election beginning with the party primaries in the state. We are not worried when people out of genuine interest to salvage Borno state came out to indicate their interest in the governorship contest. Our concern is much more on the manner at which the varying interest in being maneuvered. For example, 15 out of the current 27 APC Aspirants, who bought the form for the governorship, were being sponsored by public funds, as we learnt the money for their forms were withdrawn from the same account. This is something we are calling on the ICPC and EFCC to immediately take action. Some of these people did not tell Borno citizens how and where they got twenty-two million naira (N22,000,000) over night to buy form for the governorship seat even when they are known to have no such amount. Others who have their mouth running faster had revealed their source of sponsorship, which is why we are calling on the anti graft agencies to come in as these are public funds intended for political chaos that may lead to another unrest in the state. Another area of concern is the complained we are receiving from some of our wards heads, district heads and other local traditional title holders of being force to play part in the political arena. These people are not politicians and they position should be respected even if a royalty is involved in the build up for 2019 guber seat in the state. We regard this as infringement on the rights of this people. We would like to stress that, the party at National level should beam its light more on the planned political chaos being put in place by the rise of another political militia. We are tired of bloodshed in Borno state, we have seen enough of it and have buried many innocent souls in the last nine years and are still burying. The conference is holding at the Federal Foreign Office, Berlin – Germany. The conference is jointly organised by the United Nations, Government of Germany, Nigeria and Norway. The conference aims to increase global advocacy and increased access to funding for the UN and other Humanitarian agencies undertaking emergency, livelihoods and protection activities for victims of Boko Haram insurgency. According to the UN, millions of people in Africa’s Lake Chad region (north-east Nigeria and parts of Niger, Chad and Cameroon) are facing a profound and protracted humanitarian crisis driven by extreme poverty, climate change and violent conflict. The crisis has led to massive internal and cross-border displacement of 2.4 million people, destruction of livelihoods, disruption of local governance systems, human rights abuses, and disruption of health, education and other basic services. More than ten million vulnerable people need life-saving humanitarian assistance and protection today. Women and children are particularly hard hit. The entire region need inclusive governance systems, better social services delivery, sustainable natural resources management and more livelihoods opportunities. A forward-looking, comprehensive response to the crises which bring together humanitarian and development actors is vital for the future of the people in the region. In February 2017, a conference on the Lake Chad region co-hosted by Germany, Nigeria, Norway, and the United Nations took place in Oslo. Donors pledged US$672 million to emergency assistance and support in 2017 and beyond. The humanitarian response was scaled up significantly: more than six million people were reached with assistance in 2017, and a famine was averted in north-east Nigeria. Chinese Government has always paid close attention to the security in the region.China is having a conference currently with Africa to ensure strong cooperation the outcome of the conference will build africa's capacity.China is willing to support the region.........no Immeadiate financial support . Poland- in January Poland took up role as member United Nations security council and has donated 940,000 pieces of military to tchad in the Lake Chad Region. Poland pledged 233 million euro in addition to equipment of same amount. Spain committed to assist the affected communities and have committed to.support the region with 6 Million Euro.Governments in the region must develop a strategy for security coordination to allow citzens to pick up pieces of their lives. She has pulled the trigger of change. Once again, another colonial heritage is hit and it is just a matter of time before it will collapse, if not instantly. The world is made of two kinds of people: one, the radicals who bring about change, as in chemical reactions, and two, the followers. While humanity spends almost all of its time following, it is gifted from time to time with activists who activate the process of transformation by introducing new ideas that challenge the status quo. The action of Firdaus squarely places her here. In the eyes of the conformist, any protest against any inherited tradition appears brazen because the attendant reproach by its custodians is predictable. Some can even blackmail it as cheap publicity or other names that alludes to their intolerance to the new idea. Call it whatever, the truth is that universally, civil rights are hardly granted on a platter of gold. They are fought for one way or another and jealously guarded as a result. Where they are declared cheaply, like in our constitution, their breach is greeted with a manifest docility. The protest of Firdaus cannot be dismissed in the laidback fashion some traditionalists want us to believe. It does not make sense to abort her right to practice as a lawyer simply because she wore a headscarf on an occasion in a country that preaches freedom of religion. Some questions are pertinent here. What significant meaning does such intolerance to our diversity makes to cause such denial? Would someone sustain any injury as a result of her headscarf? Has Muslim-majority Nigeria become far-right Kurz’s Austria or still answerable to the British crown? What merit does a woman’s open hair add to her knowledge and practice as a lawyer? To Firdaus, however, covering her hair – a part of her beauty as a woman – is a religious obligation which the constitution has pledged to guarantee. It is a clear injunction for Muslim women in the Quran (24:31). It is not extremism at all, unlike covering the face, which is subject to interpretation, or wearing a beard or a turban which are optional. Even as Africans, who would like to see his mother walking with bare hair in public? To the African lady, the hair is part of her privacy and covering it in our culture is a sign of decency. A woman displays it only in attempt to attract a suitor or in appeal for appreciation by men around her. Without these two reasons, she does not feel comfortable displaying it to people, especially in the presence of those she respects most. In fact, if the woman’s hair is nothing, why are some people protesting against the headscarf? Must men see it? So from the point of view of Islam and African tradition, the headscarf is normal. However, to colonial tradition and its upholders, it is taboo on the bar. Now, for how long must we remain slaves to a colonial relic that is at variance with our tradition and does not respect our diversity? As an advocate of secular Nigeria, I believe we should respect the decision of others once they do not deny our right to personal liberty or violate the sanctity of our lives, property and dignity. If any regulation will choose to deny anyone this right, then it - not Firdaus and her likes - is in breach of the constitution and that law must be amended accordingly. The Bar is a station of reason. A headscarf will not in any way hinder Firdaus from performing creditably as a lawyer or a magistrate. No court of law in the modern world will shred itself of logic and side with the Nigerian bar against Firdaus on the issue of headscarf. Similar cases have been treated elsewhere as cited by some contributors to the present debate. I feel the authorities must not wait for similar verdicts before contemplating some amendments now. Here, there are three scenarios. One, the authorities may revolutionarily think of abolishing the colonial dressing code altogether. Many distinguished jurists have spoken before of its incompatibility with our climate and suffocating court conditions. Instead of the black suit, gown, wig, etc, it can just go for a decent dress of a lawyer’s choice as our universities are doing today. Lawyers are people of knowledge and dignity. It is very doubtful if anyone would be irresponsible to wear a disgraceful dress on the bench. Discarding the code will not only give members the liberty they need, it will also respect our diversity and avoid incidents like the one in question. Two, the authorities can maintain the colonial code but adopt the liberal interpretation of its use that will accommodate climatic and cultural preferences. Depending on individual’s choice, the wig can be alone or cushioned by a headscarf; the skirt can be long enough to reach the ankles as do trousers for men; the whole dress could be wide enough to allow – if desired by the individual – air circulation and conceal body lines. I wonder why we men are interested in stripping the woman while we cover ourselves fully. In this, even the Bar is failing to accord her more than the dignity of an object. And some women are comfortable with that dehumanization. Three, the authorities can notoriously stick to the colonial code despite its unsuitability for our climate, culture and conditions of our courts. This option, I must say, will not last long after Firdaus. In few years to come, there will be many Firdauses who will individually or collectively challenge the embarrassing irrationality of the code through similar protests. It will only be a matter of time before the present code gives way to something more logical, as is always the fate of laws that negate human liberty. When we were students, the conditions of our universities in the North were radically different from how they are today except, perhaps for Bayero University and University of Sokoto. This was Ahmadu Bello University in 1978: Alcohol was sold everywhere including in every student common room, staff clubs and canteens. Students had unfettered access to girls’ hostels from 10am to 10pm. In some hostels, like Barau Dikko, there was no separate hostel for girls. Right from day one, at the two weeks orientation program, new students were encouraged to adopt lifestyles of social and academic freedom – and you know what that means. Student clubs had unfettered access to common rooms and dining halls to host events that could include the use of these common facilities for drinking alcohol. The Muslim Students’ Society (MSS), A. B. U. branch, wrote, to no avail, to the authorities a number of protest letters against the misuse of dining space and kitchenware by palmwine drinkers club – Kegites. Tired of the deaf ear, some MSS members one night violently disrupted the 1979 “gyration” night at the dining hall of Ribadu Hall. The university authorities responded by dismissing the entire MSS Exco. Mass protests by MSS members ensued and the school continued to dismiss attackers on beer parlours on Samaru and Kongo campuses. Some students then, including many Muslim students, condemned the protests against sale of alcohol on campus, saying that many Muslims too drink alcohol, that religion is a personal affair and such other excuses that are repeated against Firdaus today. Some asked of what benefit it was to stop beer sale on campus when it is sold in parlours across the road in Samaru. Etc. But it was too late. MSS has fired the gun of change at the heart of licentious living on campus. Though many members suffered dismissal, the authorities finally succumbed to reason and all campuses of the university were cleansed of alcohol by the time we were graduating in 1982. Professor Ango Abdullahi, who signed those dismissal letters, also banned us from “visiting” our girl friends in their hostels. Guys could only wait outside the hostel and send for the girl student. When two students violated the rule, the ever resolute VC did not hesitate to dismiss them. The deterrence worked. Other universities and polytechnics in the North followed the line – and I guess some southern universities too. Had not those MSS members damned the consequences, the change would not have come so soon. Gandhi, King Jr, Mandela, and many others followed the path of protest and today humanity stands in appreciation of their courage. The defiance of Rosa Parks to give up her seat for a white passenger in 1955 fired protests that gave tremendous impetus to the civil rights movements in America. Her defiance was not futile. Our Firdaus may not look that big today, but her courage will be remembered by Nigerian women who as lawyers will enjoy the freedom to wear the headscarf. The dress she wore on that historic occasion costs only some few thousands today, it will in fifty years from now sell for millions of Naira. The authorities may deny Firdaus a permit to the bar but she has many options in life where her impact will be felt more. If she picks up lecturing law, for example, she will have the opportunity to reproduce thousands of Firdauses for Nigeria and the world in her lifetime. God, the Most High, may have something big for her in store, for He does not abandon whoever stands up for justice. Today, the expelled members of MSS, ABU, in the late 1970s and early 1980s are professors and PhDs, contributing in various sectors to the development of the country. Today also, after 40 years, the same Muslim students that opposed the MSS in 1978 on alcohol ban will hesitate to send their wards to any Nigerian university where alcohol is sold rampantly or boys have unfettered access to their daughters’ rooms or where drugs circulate freely. Also, no sane white-American will accept a law that prefers him over an African-American in a bus. Irrational traditions appear invincible before they are challenged. But once decisively dared, they are quickly shaken and give way ultimately. Firdaus has rightly pulled the headscarf trigger. Changes will definitely follow, sooner or later. I do not doubt that when the names of women that fought for civil rights are written in Nigeria of the early 20th Century, the name Amasa Firdaus will be written in gold. FOOD LOSSES AND FOOD WASTE: ENVIRONMENTAL ASPECT By Aishatu Mala Musa* The world population is expected to reach 10.5 billion by 2050 (UN 2013), food losses and food waste will aggravate global food security concerns and this will be more demanding amongst the poor communities of the world. It has been predicted that about 1.3 billion tons of food is wasted or lost globally annually, reduction of these losses increase the amount of food available for human consumption. Food loss mostly happens during harvesting, sorting, threshing grading storage, and transportation of farm produce while food waste is the loss of edible food due to human action or inaction, such as throwing away farm produce (carrot, yam) because it is not of a normal (usual) shape or not finishing up the meal served to an individual. Municipal solid waste disposal is a bottleneck to the development of most cities around the world. As urbanization, economic growth and multi-racial societies grow, there is attendant increase in the amount of waste generated. Mismanagement of wastes poses both environmental and economic consequences to the society. The pollution of ground water with leachates, direct contact to the soil, pollution of air with pungent odor, prevalence of rodents, roads strewn with flying wastes, are some of the problems associated with improper management of wastes. Most wastes are putrescible (organic) that have high moisture content and can decompose easily If wastes can be safely composted, it will reduce the amount of wastes that are sent to dumpsites and these composts when applied to agricultural lands or gardens can reduce the amount of synthetic fertilizer and/or reduce financial input that will be used and has also reduced the amount of waste that will have otherwise ended up in the landfills. Composting redirects most parts of biodegradable portion of municipal solid waste that will end up in landfills and such action enhances environmental sustainability of municipal solid waste management and economic viability. Municipal solid waste mostly accounts for more than 60% (by weight) of a community’s residential solid waste and it is mostly made up of organic materials. Agricultural waste compost addition to agricultural land has been natural to man since the beginning of times but now as the waste generation of man is increasing it is natural that we should find a means of completing the cycle of nature through production, usage and returning the waste back to land properly. Our wisdom of improvising for the fertilization of our farms with cow dung, chicken droppings and other sources of organic manures is very helpful. Every year with the little fertilizer our farmers apply to our lands they make a meaningful harvest but unfortunately some quantities are lost along the chain (harvesting, threshing, transporting, processing). One of the major problems of the agricultural sector as outlined severally by the FAO is not a shortage of food per se but an increment in food loss. Food loss and food waste account for a very large percent of the foods that go to waste annually. A third of food bought by residents in most industrialized countries goes to waste. In sub-Saharan Africa, the waste is mostly confined to those arising during harvesting threshing and/or going to farm. The culture of consuming almost all vegetables both in the fresh and dry forms has also in a way reduced the amount of food lost annually in Africa. Insecurity has also had its share in the food loss scenario where people fled from their homes before the harvests. According to FAO, in developing countries food waste and losses occurs mainly at the early stages of the food value chain and can be traced to financial, managerial and technical constraints in harvesting techniques as well as storage and cooling facilities. Strengthening the supply chain through the direct support of farmers and investments in infrastructure, transportation, as well as in an expansion of the food and packaging industry could help to reduce the amount of food loss and waste. Food losses and food waste influence global food security. The main channels advocated for more food supply are increasing production area and/or increasing yield of harvest per unit area but the major leaking pipe always overlooked as confirmed by FAO is always postharvest losses. In a world where millions go to bed without food, it would be a crime to allow food losses and food waste to continue. Most people think they are not wasting food but for every morsel thrown out into in the dustbin it should have landed in the hands of a child somewhere. Food waste does not imply taking out a huge quantity of food and throwing it out. But it also includes the scrap from your plate that you feel you shouldn’t finish up. If we start the culture of saving up food by reducing to the barest minimum food we waste, it will go a long way in alleviating the problems of hunger in the world. If we imbibe the culture of sharing out what we have in excess before it spoils, it will go a long way in bringing smiles to the faces of dozens. Another unfortunate way of food wastage on the table is serving beyond ones capacity and one ends up leaving the food lost annually in Africa. Insecurity has also had its share in the food loss scenario where people fled from their homes before the harvests. According to FAO, in developing countries food waste and losses occurs mainly at the early stages of the food value chain and can be traced to financial, managerial and technical constraints in harvesting techniques as well as storage and cooling facilities. Strengthening the supply chain through the direct support of farmers and investments in infrastructure, transportation, as well as in an expansion of the food and packaging industry could help to reduce the amount of food loss and waste. Food losses and food waste influence global food security. The main channels advocated for more food supply are increasing production area and/or increasing yield of harvest per unit area but the major leaking pipe always overlooked as confirmed by FAO is always postharvest losses. In a world where millions go to bed without food, it would be a crime to allow food losses and food waste to continue. Most people think they are not wasting food but for every morsel thrown out into in the dustbin it should have landed in the hands of a child somewhere. Food waste does not imply taking out a huge quantity of food and throwing it out. But it also includes the scrap from your plate that you feel you shouldn’t finish up. If we start the culture of saving up food by reducing to the barest minimum food we waste, it will go a long way in alleviating the problems of hunger in the world. If we imbibe the culture of sharing out what we have in excess before it spoils, it will go a long way in bringing smiles to the faces of dozens. Another unfortunate way of food wastage on the table is serving beyond ones capacity and one ends up leaving the food on the table only for it to be thrown out, we need to imbibe the habit of serving what we can finish up and then we need to learn to eat leftover food. However, if one lives in Northern Nigeria in an area where almajiri can be found the issue of food waste is almost zero but where the person lives in a GRA or where the almajirai dare not tread, then most leftover food will be in the dustbin. In northern Nigeria, the abundance of sunshine has also made it easier to reduce food waste because one can dry up any leftover or surplus food and give to domestic animals. Food waste statistics may not be very much in the north east because there are a lot of people that will be ready to eat leftover food if they can access it. But yet, this is a serious problem globally and we need to ensure that it does not creep up our doorways. A slice of bread when thrown away is food waste, a pack of sweet potato thrown away because it has been allowed to rot is food waste. Cottage Industries The time for the opening up of cottage industries in the north east is now. The northeast has been bedeviled with insecurity, loss of lives, livelihood and properties for almost a decade now. Opening up of such industries will give our local people work to do and it will help in reducing the annual losses we incur as a result of glut. Industries for the processing of produce like; onion, pepper, seasoned pepper, ginger powder, gruel powder and the likes These are things that are produced (farmed) with virtually no much incentive from the government. If we can help these local farmers to produce a little more, buy up their harvests, processand package it, markets will open up before we realize it even if it will be a seasonal business. THE CHALLENGE As concerned citizens, the task before us is how to harness opportunities for the betterment of the northeast to help the people, alleviate their poverty and help build their capacity. One of the major difficulties faced by most people in the north east with regards to obtaining loan from the federal government and/or financial institutions is the bureaucratic process involved. I will advocate that the next time we see an advert circulating for individuals in whatever age group to come and apply for a loan from the federal government to kick start a business, we organize the young men and women in our neighborhood and go forward and help them with all the filling up of forms and writing of proposals to ensure that they succeed. Even if it means putting in our resources it will be worthy because if they are able to access the loan and start up a viable business we will have aided in pulling one or more people up out of the poverty line. *Aishatu Teaches soil science at the Modibbo Adama University of Technology, Yola , Currently a PhD candidate in Soil and Environmental Management Adamawa State, , Universiti Putra Malaysia. Nigeria. Abuja is probably the worst-hit of Nigerian cities by this recession. It is only understandable: Abuja works at nothing but revels in wanton opulent, fed strictly from pens adding zeros behind a whole number. It's buildings are populated with straw companies gliding on patronage and privilege, not rights, merit and productivity. Most of its inhabitants are currently in what seems a state of disbelief, if not shock. My son and I walked lazily to Sheraton two Saturdays ago and from the gate you got a surprise: no line of traffic! The lounge was empty as the car park was vacant. We sat in surprise at the little corners of decay creeping on the lounge, part of which was even poorly lit. Of course, even Maitama and Asokoro are wrapped in thick darkness these days at 8pm if grid power fails. I was surprised at the black silence I met in these desolate palaces. Everywhere signs hang on homes and high-rise office buildings begging for tenants. I called a number on one and the voice that answered said it was for sale: 3.6billion, seven-story building with a footprint of about 250sqm. "I see". There is good hiding in evil and sometimes you don't even have to look too deeply to see it. Too many wealth in Nigeria is strictly in figures without any underlying source or feeder spring. If you got your money through work and creativity; if they put you in a desert, you will still replicate the feat. What is called a recession in regular economics is but a dethrone of false money, the overthrow of pretenders and wealth built with the tip of a pen so that reality and productivity can take over. It is an inevitable passage if nature is correctly programmed. In a hilarious circle I was told about a typical Abuja moneybags whose fortune has now turned around. He was in money - and you know what I mean. In height of his affluence he collected two more wives to make a total of three. But the noose had been getting tighter and, all streams gone dry, he applied for a loan from a bank. Not so well exposed to the hazard of seeking credit from Nigerian banks, he was exceedingly positive he will soon be credited and so went with gusto to the manager's office on an appointed day to get the final answer on his application. When he was told that he had been turned down, he lost control of himself so completely that he popped on himself right there in the bank. He was helped into the bathroom and offered a ton of tissues and when he had become manageable, they led him into a taxi and gave him a thousand naira to the bank's happy ending of the personal tragedy. The story teaches us that wealth without foundation will end in sudden failure. It is not only Abuja or the typical, overweight Nigerian big man, Nigeria itself is a victim of lazy wealth: oil is not a result of hard work or creativity. We don't even as much as have local capacity to drill the oil! If we don't build our economy by adding value through processing and developing our human resources, we won't end up much better than that poor individual you just laughed at." It is time to start building real and sustainable wealth, enough of what used to be...The difference between the poor and rich nations is not the age of the Nation. This can be demonstrated by countries like India and Egypt, which are more than 2000 years old and are still poor countries. Japan has limited territory, 80% mountainous, unsuitable for agriculture or farming, but is the second in worlds economy. The country is like an immense floating factory, importing raw material from the whole world and exporting manufactured products. The biggest country in Africa that the United Kingdom colonised is Nigeria. The biggest country that the United Kingdom colonised in Asia is India (which then comprised the present Pakistan and Bangladesh). When the UK came into Nigeria and India, like all other countries they colonised, they brought along their technology, religion (Christianity), and culture: names, dressing, food, language, etc. Try as hard as the British did, India rejected the British religion, names, dressing, food, and even language, but they did not reject the British technology. Today, 80.5% of Indians are Hindus; 13.4% Muslims; 2.3% Christians; 1.9% Sikhs; 0.8% Buddhists, etc. It is rare to find an Indian with an English name or dressed in suit. On the other hand, Nigeria embraced, to a large extent, the British religion, British culture – names, dressing, foods, and language – but rejected the British technology. The difference between the Nigerian and the Indian experiences is that while India is proud of its heritage, Nigeria takes little pride in its heritage, a situation that has affected the nationalism of Nigerians and our development as a nation. Before the advent of Christianity, the Arabs had brought Islam into Nigeria through the North. Islam also wiped away much of the culture of Northern Nigeria. has only Sharia Courts but no Customary Courts. World have shaped our lives to be like theirs and we have lost much or all of our identity. Long after the British and Arabs left Nigeria, Nigeria has waxed strong in religion to the extent that Nigerians now set up religious branches of their home-grown churches in Europe, the Americas, Asia and other African countries. Just like the Whites brought the gospel to us, Nigerians now take the gospel back to the Whites. In Islam, we are also very vibrant to the extent that if there is a blasphemous comment against Islam in Denmark or the US, even if there is no violent reaction in Saudi Arabia, the Islamic headquarters of the world, there will be loss of lives and destruction of property in Nigeria. If the United Arab Emirates, a country with 75% Muslims, is erecting the tallest building in the world and encouraging the world to come and invest in its country by providing a friendly environment, Boko Haram ensures that the economy of the North (and by extension that of Nigeria) is crippled with bombs and bullets unless every Nigerian converts to Boko Haram’s brand of Islam. In the East we have IPOB wrecking havoc. While in the South - South region, Mend, Avengers and so on destroying the Heart of our Nations Economy. We are indeed a very religious people. Meanwhile, while we are building the biggest churches and mosques, the Indians, South Africans, Chinese, Europeans and Americans have taken over our key markets: telecoms, satellite TV, multinationals, banking, oil and gas, automobile, aviation, shopping malls, hospitality, etc. Ironically, despite our exploits in religion, we are a people with little godliness, a people without scruples. It is rare to do business with a Nigerian pastor, deacon, knight, elder, brother, sister, imam, mullah, mallam, alhaji or alhaja without the person laying landmine of bribes and deception on your path. money, financial engineering, deal, or whatever. But if it does not change hands, nothing gets done. Some people assume that sleaze is a problem of public functionaries, but the private sector seems to be worse than the public sector these days. The situation is that the more religious we get, the baser we become. Our land never knew the type of bloodshed experienced from religious extremists, political desperadoes, ritual killers, armed robbers, kidnappers, internet scammers, university cultists, and lynch mobs. Life has become so cheap and brutish that everyday seems to be a bonanza. We import the petroleum that we have in abundance, rice and beans that our land can produce in abundance, and even toothpicks that primary school children can produce with little or no effort. Yet we drive the best of cars and live in the best of edifices, visit the best places in the world for holidays and use the most expensive electronic and telecoms gadgets. It is now a sign of poverty for a Nigerian to ride a saloon car. Four-wheel drive is it! where about 70 per cent live below poverty. Private jets have become as common as cars. and its sick people are running to India for treatment. travelling to the country for medical treatment. India has joined the nuclear powers. India has launched a successful mission to the moon. Yet bicycles and tricycles are common sights in India. But in Nigeria, only the wretched of the earth ride bicycles. I have intentionally chosen to compare Nigeria with India rather than China, South Korea, Brazil, Malaysia, or Singapore, because of the similarities between India and Nigeria. But these countries were not as promising as Nigeria at the time of our independence. Some would say that our undoing is our size: the 2012 United Nations estimate puts Nigeria’s population at 166 million, while India has a population of about a billion. Some would blame it on the multiplicity of ethnic groups: we have 250 ethnic groups; India has more than 2000 ethnic groups. Some would hang it on the diversity in religion: we have two major religions – Christianity and Islam; but India has many. Some would say it is because we are young as an independent nation: we have 56 years of independence; India has 65 years, while apartheid ended in South Africa only in 1994. I am a Muslim, and nothing can change me from practising Islam. But I think that our country is daily sinking into religiosity to the detriment of godliness. Our land is sick and needs healing. “If my people who are called by my name will humble themselves, and pray and seek my face, and turn from their wicked ways, then I will hear from heaven, and will forgive their sin and heal their land” is still a saying that is germane to our current situation. We need more godliness than religion; more work and less hope; and more action and less words. Let everyone tidy up his or her corner first and demand fervently that our leaders tidy their areas of governance. Our nation is degenerating at a fast pace and we need to save it now. Let make Nigeria Great again!! Hamza Danliman.